Nobody wants a bad reputation, especially companies and corporates where bad reputation equals bad business. However, there are some companies that have a bad reputation for bad customer care service. I’m sure you have already thought about some, or that one that just causes you to get a headache every time you think of going there for some customer care. Some companies are very notorious for giving bad service and doing nothing about it, because they have the upper hand and I mean, they have many other customers besides you so you could matter less. On the bright side however, there does exists some companies who treat you like the kings and queens you are and give you the best possible care. If only you could hug them afterward to show your gratitude, but a smile on your face is more than enough. You don’t want to get awkward or anything. No matter the experience, Kenyans take it to social media. Correction, when we are furious and want to vent it out, we take it to Twitter. Some would imagine that that was why Twitter was invented in the first place. Once one person starts, all the other hurt and resentful guys jump on it and hence the birth of a hashtag. But what happens next? It trends for a day or two, but then a shiny new hashtag comes along and your complaint is all but forgotten. Well guys, there is a new way to be heard. 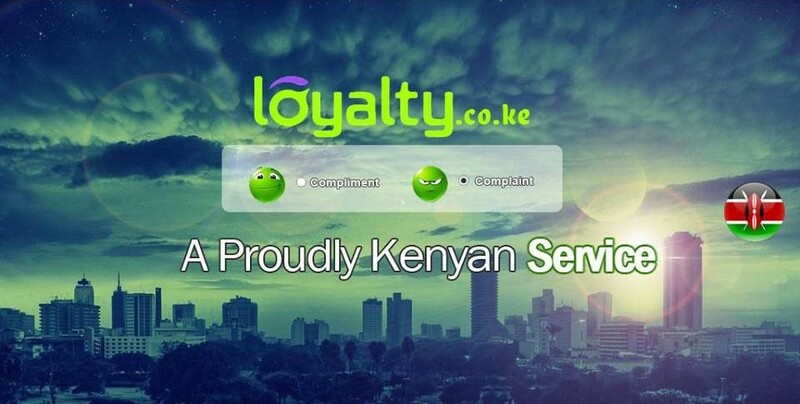 Here comes Loyalty.co.ke, a platform designed and developed by twin brothers, Anthony Muraya and Edwin Mbugua, for Kenyans who have received bad service to be able to voice their displeasure publicly in a way that forces companies to respond accordingly and change complaints to compliments. Right from the company they hired in India to do their development being suddenly shut down, to their developers here being robbed of their laptops with source code, these guys have had it tough but have been able to complete it and bring their platform to the masses. The site will be going live this Saturday, 28th May at the Cisco Lab at Riara University. What about now, have I caught your attention yet? Maybe I should tell you more. This platform is free for users, therefore their business model is base around companies and not consumers. It is a subscription service where companies pay a certain monthly few based on the volume of complaints they receive. Paying the subscription will permit them to have full access to the user complaints, right from the incident that happened, the name of the employee responsible, the branch the incident happened and all the appropriate information of the complainant. Why would company pay for that? This is where the scaring comes in. Now, if people google a company and the company has received a lot of complaints on Loyalty.co.ke, then be sure they will be there for the world to see. The idea behind this is that a potential customer or client will probably second guess their decision to interact with a company that is pretty bad at customer care based on the complaints. Furthermore, on loyalty.co.ke, companies are tagged as ‘companies that respond’ and ‘companies that do not respond’ contributing to the overall reputation of the company. That’s not it guys. After every three months, or every quarter, the Loyalty team will compile a report highlighting the best and worst companies in terms of customer care and release it to the public to know. But wait, there is Twitter which we use daily anyway, why would we use Loyalty.co.ke? Twitter has a character limit of 140 character whereas you can vent all you want on Loyalty with a 1200 character limit. Plus for a company to get your full complaint on Twitter, they have to follow you back first in order for you to Direct Message them, which may not happen removing the direct link to them you would have had. Futhermore, there are several employees that handle our requests and complaints on social media. Most of the time, you may need to tweet severally to get a response from one of them, or most times, you are stuck with those politically correct replies that do not solve your problem. Well Loyalty promise to send your complaint straight to the horse mouth and get the appropriate help. Surely I’ve got your attention now? No matter how much companies may want to ignore your complaints, these guys will make sure they won’t. All complaints will be directed accordingly. If they happen at a branch, then only that branch will receive the complaint and it is at their own discretion to fix it. So this platform is going live on Saturday 28th May 2016 and will be focusing solely on mobile operators for the next 3 months. If you have something boiling and raging inside you, please feel free to share on Loyalty, trust me, you won’t be the only one!